A Facebook group calling for Boston Marks & Spencer store to be saved now has more than 1,700 members. News of the retail giant's decision to close the town's Market Street store was greeted with shock when it was revealed on Tuesday. M&S say they are in consultation with the 49 staff at the store on their future. The proposed closure is part of the company's ongoing programme to restructure the stores it has across the country. But it has left locals shocked, with hundreds taking to social media to make their point about the impact it will have on Boston. And MP Matt Warman, Lincolnshire County Council, the chairman of Boston's Town Area Committee (BTAC) and other shops in the centre have all spoken of their disappointment at the news. Since it was set up on Tuesday, the Save Our Boston Marks & Spencer group on Facebook has been followed by hundreds of people. On Friday morning, the figure stood at 1,760. The group states: "Following today’s sad news that our town is to lose its M&S branch, let’s make sure the company knows how we feel. Please like this page and also leave a comment with your thoughts. The alternative stores are not viable options for everyone. "Whether this is successful or not it is important that the company know our feelings. Boston is slowly being stripped of major retailers and we should have a voice! The number of comments and supporters will be sent to the Chairman at their Head Office. "Let’s do this! Share with all your friends urging them to like and comment. Don't forget to LIKE this post." Boston MP Mr Warman said it was 'deeply disappointing' he was happy to talk to his constituents about the proposed closure. "Marks and Spencers is an iconic retailer, and a huge asset to Boston. It’s deeply disappointing that they are consulting on closing their Boston store, particularly when the manager assured me recently it was one of the most vibrant shops in the region," he said. "If the closure goes ahead, I’m assured staff will be offered the chance to work elsewhere in the business prior to any redundancy. I will of course work with the Jobcentre and others to seek to make sure that those employees and their families are found new roles as soon as possible if necessary." "Up and down the country high streets are changing, largely because of the internet. 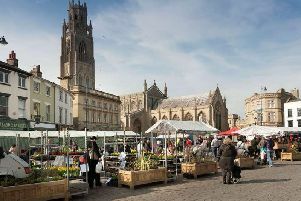 Boston is lucky to still have a popular market, a range of independent shops and a council that has invested in putting on a larger number of events in town. These all encourage more visitors that can sustain businesses, and sit alongside the Government’s welcome agenda to slash business rates. But ultimately we should all, as I try to do, support our local businesses and traders if we want to see them survive. We will miss big retailers if they go – their future is in our hands." "Any constituent who would like to get in touch with me about this should email matt.warman.mp@parliament.uk"
Cllr Colin Davie, executive member for economy and place for Lincolnshire County Council, said: “This is very disappointing news for Boston. Cllr Sue Ransome, chairman of the Boston Town Area Committee (BTAC), said: “It’s really sad news. M&S is a High Street stalwart.